"Chagall" redirects here. For other uses, see Chagall (disambiguation). Marc Zakharovich Chagall (/ʃəˈɡɑːl/ shə-GAHL;[nb 1] born Moishe Zakharovich Shagal; 6 July [O.S. 24 June] 1887 – 28 March 1985) was a Russian-French artist of Belarusian Jewish origin. An early modernist, he was associated with several major artistic styles and created works in virtually every artistic format, including painting, book illustrations, stained glass, stage sets, ceramic, tapestries and fine art prints. Marc Chagall was born Moishe Segal in a Lithuanian Jewish Hassidic family in Liozna, near the city of Vitebsk (Belarus, then part of the Russian Empire) in 1887. [note] At the time of his birth, Vitebsk's population was about 66,000, with half the population being Jewish. A picturesque city of churches and synagogues, it was called "Russian Toledo", after a cosmopolitan city of the former Spanish Empire. As the city was built mostly of wood, little of it survived years of occupation and destruction during World War II. Chagall wrote as a boy; "I felt at every step that I was a Jew—people made me feel it". During a pogrom, Chagall wrote that: "The street lamps are out. I feel panicky, especially in front of butchers' windows. There you can see calves that are still alive lying beside the butchers' hatchets and knives". When asked by some pogromniks "Jew or not? ", Chagall remembered thinking: "My pockets are empty, my fingers sensitive, my legs weak and they are out for blood. My death would be futile. I so wanted to live". Chagall denied being a Jew, leading the pogromniks to shout "All right! Get along!" Chagall was friends with Sholom Dovber Schneersohn, and later with Menachem M. Schneerson. A turning point of his artistic life came when he first noticed a fellow student drawing. Baal-Teshuva writes that for the young Chagall, watching someone draw "was like a vision, a revelation in black and white". Chagall would later say that there was no art of any kind in his family's home and the concept was totally alien to him. When Chagall asked the schoolmate how he learned to draw, his friend replied, "Go and find a book in the library, idiot, choose any picture you like, and just copy it". He soon began copying images from books and found the experience so rewarding he then decided he wanted to become an artist. He eventually confided to his mother, "I want to be a painter", although she could not yet understand his sudden interest in art or why he would choose a vocation that "seemed so impractical", writes Goodman. The young Chagall explained, "There's a place in town; if I'm admitted and if I complete the course, I'll come out a regular artist. I'd be so happy!" It was 1906, and he had noticed the studio of Yehuda (Yuri) Pen, a realist artist who also operated a small drawing school in Vitebsk, which included the future artists El Lissitzky and Ossip Zadkine. Due to Chagall's youth and lack of income, Pen offered to teach him free of charge. However, after a few months at the school, Chagall realized that academic portrait painting did not suit his desires. In 1906, he moved to Saint Petersburg which was then the capital of Russia and the center of the country's artistic life with its famous art schools. Since Jews were not permitted into the city without an internal passport, he managed to get a temporary passport from a friend. He enrolled in a prestigious art school and studied there for two years. By 1907, he had begun painting naturalistic self-portraits and landscapes. Chagall was an active member of the irregular freemasonic lodge, the Grand Orient of Russia's Peoples. He belonged to the "Vitebsk" lodge. In 1910, Chagall relocated to Paris to develop his artistic style. Art historian and curator James Sweeney notes that when Chagall first arrived in Paris, Cubism was the dominant art form, and French art was still dominated by the "materialistic outlook of the 19th century". But Chagall arrived from Russia with "a ripe color gift, a fresh, unashamed response to sentiment, a feeling for simple poetry and a sense of humor", he adds. These notions were alien to Paris at that time, and as a result, his first recognition came not from other painters but from poets such as Blaise Cendrars and Guillaume Apollinaire. :7 Art historian Jean Leymarie observes that Chagall began thinking of art as "emerging from the internal being outward, from the seen object to the psychic outpouring", which was the reverse of the Cubist way of creating. He therefore developed friendships with Guillaume Apollinaire and other avant-garde luminaries such as Robert Delaunay and Fernand Léger. Baal-Teshuva writes that "Chagall's dream of Paris, the city of light and above all, of freedom, had come true. ":33 His first days were a hardship for the 23-year-old Chagall, who was lonely in the big city and unable to speak French. Some days he "felt like fleeing back to Russia, as he daydreamed while he painted, about the riches of Russian folklore, his Hasidic experiences, his family, and especially Bella". Chagall was exhilarated, intoxicated, as he strolled through the streets and along the banks of the Seine. Everything about the French capital excited him: the shops, the smell of fresh bread in the morning, the markets with their fresh fruit and vegetables, the wide boulevards, the cafés and restaurants, and above all the Eiffel Tower. During his time in Paris, Chagall was constantly reminded of his home in Vitebsk, as Paris was also home to many painters, writers, poets, composers, dancers, and other émigrés from the Russian Empire. However, "night after night he painted until dawn", only then going to bed for a few hours, and resisted the many temptations of the big city at night. :44 "My homeland exists only in my soul", he once said. :viii He continued painting Jewish motifs and subjects from his memories of Vitebsk, although he included Parisian scenes—- the Eiffel Tower in particular, along with portraits. Many of his works were updated versions of paintings he had made in Russia, transposed into Fauvist or Cubist keys. The October Revolution of 1917 was a dangerous time for Chagall although it also offered opportunity. Chagall wrote he came to fear Bolshevik orders pinned on fences, writing: "The factories were stopping. The horizons opened. Space and emptiness. No more bread. The black lettering on the morning posters made me feel sick at heart". Chagall was often hungry for days, later remembering watching "a bride, the beggars and the poor wretches weighted down with bundles", leading him to conclude that the new regime had turned Russia "upside down the way I turn my pictures". By then he was one of Russia's most distinguished artists and a member of the modernist avant-garde, which enjoyed special privileges and prestige as the "aesthetic arm of the revolution". He was offered a notable position as a commissar of visual arts for the country[clarification needed], but preferred something less political, and instead accepted a job as commissar of arts for Vitebsk. This resulted in his founding the Vitebsk Arts College which, adds Lewis, became the "most distinguished school of art in the Soviet Union". In 1923, Chagall left Moscow to return to France. On his way he stopped in Berlin to recover the many pictures he had left there on exhibit ten years earlier, before the war began, but was unable to find or recover any of them. Nonetheless, after returning to Paris he again "rediscovered the free expansion and fulfillment which were so essential to him", writes Lewis. With all his early works now lost, he began trying to paint from his memories of his earliest years in Vitebsk with sketches and oil paintings. Chagall later told a friend that Israel gave him "the most vivid impression he had ever received". Wullschlager notes, however, that whereas Delacroix and Matisse had found inspiration in the exoticism of North Africa, he as a Jew in Israel had different perspective. "What he was really searching for there was not external stimulus but an inner authorization from the land of his ancestors, to plunge into his work on the Bible illustrations". :343 Chagall stated that "In the East I found the Bible and part of my own being." After Germany invaded and occupied France, the Chagalls naively remained in Vichy France, unaware that French Jews, with the help of the Vichy government, were being collected and sent to German concentration camps, from which few would return. The Vichy collaborationist government, directed by Marshal Philippe Pétain, immediately upon assuming power established a commission to "redefine French citizenship" with the aim of stripping "undesirables", including naturalized citizens, of their French nationality. Chagall had been so involved with his art, that it was not until October 1940, after the Vichy government, at the behest of the Nazi occupying forces, began approving anti-Semitic laws, that he began to understand what was happening. Learning that Jews were being removed from public and academic positions, the Chagalls finally "woke up to the danger they faced". But Wullschlager notes that "by then they were trapped". :382 Their only refuge could be America, but "they could not afford the passage to New York" or the large bond that each immigrant had to provide upon entry to ensure that they would not become a financial burden to the country. After prodding by their daughter Ida, who "perceived the need to act fast",:388 and with help from Alfred Barr of the New York Museum of Modern Art, Chagall was saved by having his name added to the list of prominent artists whose lives were at risk and who the United States should try to extricate. Varian Fry, the American journalist, and Hiram Bingham IV, the American Vice-Consul in Marseilles, ran a rescue operation to smuggle artists and intellectuals out of Europe to the US by providing them with forged visas to the US. Chagall was one of over 2,000 who were rescued by this operation. He left France in May 1941, "when it was almost too late", adds Lewis. Picasso and Matisse were also invited to come to America but they decided to remain in France. Chagall and Bella arrived in New York on 23 June 1941, the day after Germany invaded the Soviet Union. :150 Ida and her husband Michel followed on the notorious refugee ship SS Navemar with a large case of Chagall's work. A chance post-war meeting in a French café between Ida and intelligence analyst Konrad Kellen led to Kellen carrying more paintings on his return to the United States. He was offered a commission by choreographer Léonide Massine of the Ballet Theatre of New York to design the sets and costumes for his new ballet, Aleko. This ballet would stage the words of Alexander Pushkin's verse narrative The Gypsies with the music of Tchaikovsky. 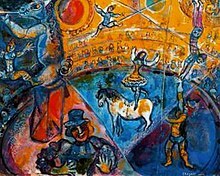 While Chagall had done stage settings before while in Russia, this was his first ballet, and it would give him the opportunity to visit Mexico. While there he quickly began to appreciate the "primitive ways and colorful art of the Mexicans," notes Cogniat. He found "something very closely related to his own nature", and did all the color detail for the sets while there. Eventually, he created four large backdrops and had Mexican seamstresses sew the ballet costumes. After a year of living with his daughter Ida and her husband Michel Gordey, he entered into a romance with Virginia Haggard, daughter of diplomat Sir Godfrey Digby Napier Haggard and great-niece of the author Sir Henry Rider Haggard; their relationship endured seven years. They had a child together, David McNeil, born 22 June 1946. Haggard recalled her "seven years of plenty" with Chagall in her book, My Life with Chagall (Robert Hale, 1986). When Matisse dies, Chagall will be the only painter left who understands what color is... His canvases are really painted, not just tossed together. Some of the last things he's done in Vence convince me that there's never been anybody since Renoir who has the feeling for light that Chagall has." Chagall's daughter Ida married art historian Franz Meyer in January 1952, and feeling that her father missed the companionship of a woman in his home, introduced him to Valentina (Vava) Brodsky, a woman from a similar Russian Jewish background, who had run a successful millinery business in London. She became his secretary, and after a few months agreed to stay only if Chagall married her. The marriage took place in July 1952:183—though six years later, when there was conflict between Ida and Vava, "Marc and Vava divorced and immediately remarried under an agreement more favourable to Vava" (Jean-Paul Crespelle, author of Chagall, l'Amour le Reve et la Vie, quoted in Haggard: My Life with Chagall). In 1954, he was engaged as set decorator for Robert Helpmann's production of Rimsky-Korsakov's opera Le Coq d'Or at the Royal Opera House, Covent Garden, but he withdrew. The Australian designer Loudon Sainthill was drafted at short notice in his place. His early pictures were often of the town where he was born and raised, Vitebsk. Cogniat notes that they are realistic and give the impression of firsthand experience by capturing a moment in time with action, often with a dramatic image. During his later years, as for instance in the "Bible series", subjects were more dramatic. He managed to blend the real with the fantastic, and combined with his use of color the pictures were always at least acceptable if not powerful. He never attempted to present pure reality but always created his atmospheres through fantasy. :91 In all cases Chagall's "most persistent subject is life itself, in its simplicity or its hidden complexity... He presents for our study places, people, and objects from his own life". Music played an important role in shaping the subjects of his work. While he later came to love the music of Bach and Mozart, during his youth he was mostly influenced by the music within the Hasidic community where he was raised. Art historian Franz Meyer points out that one of the main reasons for the unconventional nature of his work is related to the hassidism which inspired the world of his childhood and youth and had actually impressed itself on most Eastern European Jews since the 18th century. He writes, "For Chagall this is one of the deepest sources, not of inspiration, but of a certain spiritual attitude... the hassidic spirit is still the basis and source of nourishment of his art. ":24 In a talk that Chagall gave in 1963 while visiting America, he discussed some of those impressions. He was also at pains to distance his work from a single Jewish focus. At the opening of The Chagall Museum in Nice he said 'My painting represents not the dream of one people but of all humanity'. One of Chagall's major contributions to art has been his work with stained glass. This medium allowed him further to express his desire to create intense and fresh colors and had the added benefit of natural light and refraction interacting and constantly changing: everything from the position where the viewer stood to the weather outside would alter the visual effect (though this is not the case with his Hadassah windows). It was not until 1956, when he was nearly 70 years of age, that he designed windows for the church at Assy, his first major project. Then, from 1958 to 1960, he created windows for Metz Cathedral. In 1960, he began creating stained glass windows for the synagogue of Hebrew University's Hadassah Medical Center in Jerusalem. Leymarie writes that "in order to illuminate the synagogue both spiritually and physically", it was decided that the twelve windows, representing the twelve tribes of Israel, were to be filled with stained glass. Chagall envisaged the synagogue as "a crown offered to the Jewish Queen", and the windows as "jewels of translucent fire", she writes. Chagall then devoted the next two years to the task, and upon completion in 1961 the windows were exhibited in Paris and then the Museum of Modern Art in New York. They were installed permanently in Jerusalem in February 1962. Each of the twelve windows is approximately ll feet high and 8 feet (2.4 m) wide, much larger than anything he had done before. Cogniat considers them to be "his greatest work in the field of stained glass", although Virginia Haggard McNeil records Chagall's disappointment that they were to be lit with artificial light, and so would not change according to the conditions of natural light. French philosopher Gaston Bachelard commented that "Chagall reads the Bible and suddenly the passages become light. ":xii In 1973 Israel released a 12-stamp set with images of the stained-glass windows. In 1964 Chagall created a stained-glass window, entitled Peace, for the UN in honor of Dag Hammarskjöld, the UN's second secretary general who was killed in an airplane crash in Africa in 1961. The window is about 15 feet (4.6 m) wide and 12 feet (3.7 m) high and contains symbols of peace and love along with musical symbols. In 1967 he dedicated a stained-glass window to John D. Rockefeller in the Union Church of Pocantico Hills, New York. The Fraumünster church in Zurich, Switzerland, founded in 853, is known for its five large stained glass windows created by Chagall in 1967. Each window is 32 feet (9.8 m) tall by 3 feet (0.91 m) wide. Religion historian James H. Charlesworth notes that it is "surprising how Christian symbols are featured in the works of an artist who comes from a strict and Orthodox Jewish background." He surmises that Chagall, as a result of his Russian background, often used Russian icons in his paintings, with their interpretations of Christian symbols. He explains that his chosen themes were usually derived from biblical stories, and frequently portrayed the "obedience and suffering of God's chosen people." One of the panels depicts Moses receiving the Torah, with rays of light from his head. At the top of another panel is a depiction of Jesus' crucifixion. In 1978 he began creating windows for St Stephan's church in Mainz, Germany. Today, 200,000 visitors a year visit the church, and "tourists from the whole world pilgrim up St Stephan's Mount, to see the glowing blue stained glass windows by the artist Marc Chagall", states the city's web site. "St Stephan's is the only German church for which the Chagall has created windows." The website also notes, "The colours address our vital consciousness directly, because they tell of optimism, hope and delight in life", says Monsignor Klaus Mayer, who imparts Chagall's work in mediations and books. He corresponded with Chagall during 1973, and succeeded in persuading the "master of colour and the biblical message" to create a sign for Jewish-Christian attachment and international understanding. Centuries earlier Mainz had been "the capital of European Jewry", and contained the largest Jewish community in Europe, notes historian John Man. :16 In 1978, at the age of 91, Chagall created the first window and eight more followed. Chagall's collaborator Charles Marq complemented Chagall's work by adding several stained glass windows using the typical colours of Chagall. All Saints' Church, Tudeley is the only church in the world to have all its twelve windows decorated by Chagall. The other three religious buildings with complete sets of Chagall windows are the Hadassah Medical Center synagogue, the Chapel of Le Saillant, Limousin, and the Union Church of Pocantico Hills, New York. The windows at Tudeley were commissioned by Sir Henry and Lady Rosemary d'Avigdor-Goldsmid as a memorial tribute to their daughter Sarah, who died in 1963 aged 21 in a sailing accident off Rye. When Chagall arrived for the dedication of the east window in 1967, and saw the church for the first time, he exclaimed "C'est magnifique! Je les ferai tous!" ("It's beautiful! I will do them all!") Over the next ten years Chagall designed the remaining eleven windows, made again in collaboration with the glassworker Charles Marq in his workshop at Reims in northern France. The last windows were installed in 1985, just before Chagall's death. On the north side of Chichester Cathedral there is a stained glass window designed and created by Chagall at the age of 90. The window, his last commissioned work, was inspired by Psalm 150; 'Let everything that hath breath praise the Lord' at the suggestion of Dean Walter Hussey. The window was unveiled by the Duchess of Kent in 1978. Chagall visited Chicago in the early 1970s to install his mural The Four Seasons, and at that time was inspired to create a set of stained glass windows for the Art Institute of Chicago. After discussions with the Art Institute and further reflection, Chagall made the windows a tribute to the American Bicentennial, and in particular the commitment of the United States to cultural and religious freedom. The windows appeared prominently in the 1986 movie Ferris Bueller's Day Off. From 2005 to 2010, the windows were moved due to nearby construction on a new wing of the Art Institute, and for archival cleaning. 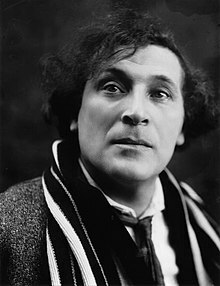 Chagall first worked on stage designs in 1914 while living in Russia, under the inspiration of the theatrical designer and artist Léon Bakst. It was during this period in the Russian theatre that formerly static ideas of stage design were, according to Cogniat, "being swept away in favor of a wholly arbitrary sense of space with different dimensions, perspectives, colors and rhythms. ":66 These changes appealed to Chagall who had been experimenting with Cubism and wanted a way to enliven his images. Designing murals and stage designs, Chagall's "dreams sprang to life and became an actual movement." After leaving Russia, twenty years passed before he was again offered a chance to design theatre sets. In the years between, his paintings still included harlequins, clowns and acrobats, which Cogniat notes "convey his sentimental attachment to and nostalgia for the theatre". His first assignment designing sets after Russia was for the ballet "Aleko" in 1942, while living in America. In 1945 he was also commissioned to design the sets and costumes for Stravinsky's Firebird. These designs contributed greatly towards his enhanced reputation in America as a major artist and, as of 2013, are still in use by New York City Ballet. Cogniat describes how Chagall's designs "immerse the spectator in a luminous, colored fairy-land where forms are mistily defined and the spaces themselves seem animated with whirlwinds or explosions." 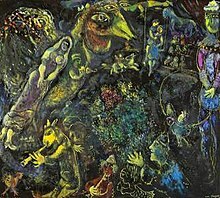 His technique of using theatrical color in this way reached its peak when Chagall returned to Paris and designed the sets for Ravel's Daphnis and Chloë in 1958. In 1964 he repainted the ceiling of the Paris Opera using 2,400 square feet (220 m2) of canvas. He painted two monumental murals which hang on opposite sides of the new Metropolitan Opera house at Lincoln Center in New York which opened in 1966. The pieces, The Sources of Music and The Triumph of Music, which hang from the top-most balcony level and extend down to the Grand Tier lobby level, were completed in France and shipped to New York, and are covered by a system of panels during the hours in which the opera house receives direct sunlight to prevent fading. He also designed the sets and costumes for a new production of Die Zauberflöte for the company which opened in February 1967 and was used through the 1981/1982 season. Author Serena Davies writes that "By the time he died in France in 1985—the last surviving master of European modernism, outliving Joan Miró by two years—he had experienced at first hand the high hopes and crushing disappointments of the Russian revolution, and had witnessed the end of the Pale of Settlement, the near annihilation of European Jewry, and the obliteration of Vitebsk, his home town, where only 118 of a population of 240,000 survived the Second World War." Chagall's final work was a commissioned piece of art for the Rehabilitation Institute of Chicago. The maquette painting titled Job had been completed, but Chagall died just before the completion of the tapestry. Yavett Cauquil Pierce was weaving the tapestry under Chagall's supervision and was the last person to work with Chagall. She left Vava and Marc Chagall's home at 4 pm on 28 March after discussing and matching the final colors from the maquette painting for the tapestry. He died that evening. His relationship with his Jewish identity was "unresolved and tragic", Davies states. He would have died without Jewish rites, had not a Jewish stranger stepped forward and said the kaddish, the Jewish prayer for the dead, over his coffin. Chagall is buried alongside his last wife Valentina "Vava" Brodsky Chagall, in the multi-denominational cemetery in the traditional artists' town of Saint Paul de Vence, in the French region of Provence. A 1928 Chagall oil painting, Les Amoureux, measuring 117.3 x 90.5 cm, depicting Bella Rosenfeld, the artist's first wife and adopted home Paris, sold for $28.5 million (with fees) at Sotheby's New York, 14 November 2017, almost doubling Chagall's 27-year-old $14.85 million auction record. In October 2010, his painting Bestiaire et Musique, depicting a bride and a fiddler floating in a night sky amid circus performers and animals, "was the star lot" at an auction in Hong Kong. When it sold for $4.1 million, it became the most expensive contemporary Western painting ever sold in Asia. Also in 1977, the government of France awarded him its highest honour, the Grand-Croix de la Legion d'honneur. 1974: Member of the Royal Academy of Science, Letters and Fine Arts of Belgium. Chagall, a short 1963 documentary, features Chagall. It won the 1964 Academy Award for Best Short Subject Documentary. Because of the international acclaim he enjoyed and the popularity of his art, a number of countries have issued commemorative stamps in his honor depicting examples from his works. In 1963 France issued a stamp of his painting, The Married Couple of the Eiffel Tower. In 1969, Israel produced a stamp depicting his King David painting. In 1973 Israel released a 12-stamp set with images of the stained-glass windows that he created for the Hadassah Hebrew University Medical Center Synagogue; each window was made to signify one of the "Twelve Tribes of Israel". In 1987, as a tribute to recognize the centennial of his birth in Belarus, seven nations engaged in a special omnibus program and released postage stamps in his honor. The countries which issued the stamps included Antigua & Barbuda, Dominica, The Gambia, Ghana, Sierra Leone and Grenada, which together produced 48 stamps and 10 souvenir sheets. Although the stamps all portray his various masterpieces, the names of the artwork are not listed on the stamps. There were also several major exhibitions of Chagall's work during his lifetime and following his death. The Musée d'art et d'histoire du judaïsme in Paris had a Chagall exhibition titled "Chagall and the Bible" in 2011. Montréal Muséum of Fine Arts, Musée des Beaux-Arts de Montréal. 28 January – 11 June 2017. Chagall: Colour and Music is the biggest Canadian exhibition ever devoted to Marc Chagall. The Museum of Biblical Art, Dallas, Texas has one of the largest collections of Chagall works on paper, hosting continuously holding rotating Chagall exhibitions. The Marc Chagall Yufuin Kinrin-ko Museum in Yufuin, Kyushu, Japan, holds about 40–50 of his works. Marc Chagall's late painting titled Job for the Job Tapestry in Chicago. Picasso, Matisse, Chagall, featuring pieces from Chagall's Bible series and more is on display now at the Sangre de Cristo Arts Center in Pueblo, Colorado. This exhibit ends 11 January 2015. Musée des Beaux Arts (Montreal Museum of Fine Arts) in Montreal Canada will be opening a Chagall exhibit on 28 January 2017 running until late June, with over 400 works on exhibit. The exhibit will then travel to Los Angeles in July 2017. During the closing ceremony of the 2014 Winter Olympics in Sochi, a Chagall-like float with clouds and dancers passed by upside down hovering above 130 costumed dancers, 40 stilt-walkers and a violinist playing folk music. 1.^ Most sources uncritically repeat the information that he was born on 7 July 1887, without specifying whether this was a Gregorian or Julian date. However, this date is incorrect. He was born on 24 June 1887 under the then Julian calendar, which translates to 6 July 1887 in the Gregorian calendar, the gap between the calendars in 1887 being 12 days. Chagall himself miscalculated the Gregorian date when he arrived in Paris in 1910, using the 13-day gap that then applied, not realising that this applied only from 1900 onwards. For further details, see Marc Chagall and His Times: A Documentary Narrative, p. 65. ^ a b Benjamin Harshav: Marc Chagall and his times: a documentary narrative. Contraversions: Jews and Other Differences. Stanford University Press; 1 edition. August 2003. ISBN 0804742146. ^ "Random House Unabridged Dictionary". Dictionary.reference.com. Retrieved 15 March 2012. ^ Matthieu Dhennin (2006). Le lexique subjectif d'Emir Kusturica: portrait d'un réalisateur. L'AGE D'HOMME. pp. 22–. ISBN 978-2-8251-3658-4. ^ "Marcchagall.narod.ru". Marcchagall.narod.ru. Retrieved 15 March 2012. ^ Binyāmîn Haršav, Marc Chagall, Barbara Harshav Marc Chagall and his times: a documentary narrative. Books.google.com.au. Retrieved 15 March 2012. ^ "Segal.org". Segal.org. 22 May 2005. Retrieved 15 March 2012. ^ Meisler, Stanley (14 April 2015). Shocking Paris: Soutine, Chagall and the Outsiders of Montparnasse. St. Martin's Press. p. 69. ISBN 1466879270. ^ a b c d Moyhahan 1992, p. 129. ^ "Marc Chagall | Russian-French artist". Encyclopedia Britannica. Retrieved 2017-08-22. ^ a b Moyhahan 1992, p. 334. ^ "Marc Chagall at Vereinigung Zürcher Kunstfreunde". Kunsthaus.ch. 30 June 2008. Retrieved 15 March 2012. ^ "El Museo de arte Thyssen-Bornemisza – (Paseo del Prado, 8, Madrid-España)". Museothyssen.org. Archived from the original on 12 March 2012. Retrieved 15 March 2012. ^ "Viewpoint: Could one man have shortened the Vietnam War?". BBC News. 8 July 2013. Retrieved 9 July 2013. ^ Tracie Rozhon (16 November 2000). "BIG DEAL; An Old Chagall Haunt, Repainted". New York Times. Retrieved 10 April 2013. ^ a b c "How music influenced the art of Marc Chagall". CBS News. 7 May 2017. ^ "Photo of stained glass at Fraumünster cathedral, Zurich, Switzerland"
^ "Youtube.com". Youtube.com. Retrieved 15 March 2012. ^ "All Saints' Church, Tudeley". Retrieved 18 December 2009. ^ "Moscow-faf.com". Moscow-faf.com. Archived from the original on 12 March 2012. Retrieved 15 March 2012. ^ "Jewishvirtuallibrary.org". Jewishvirtuallibrary.org. Retrieved 15 March 2012. ^ a b "Museum.nsk.ru". Museum.nsk.ru. Archived from the original on 25 January 2012. Retrieved 15 March 2012. ^ "Marc Chagall: Early Works from Russian Collections". The Jewish Museum. Retrieved 2017-04-04. ^ "Chagall: Love, War, and Exile". The Jewish Museum. Retrieved 2017-04-04. ^ "Hudsonvalley.org". Hudsonvalley.org. Retrieved 15 March 2012. ^ "Marc Chagall Museum". Chagal-vitebsk.com. Archived from the original on 21 March 2012. Retrieved January 28, 2019. ^ "Biblicalarts.org". Biblicalarts.org. Retrieved 15 March 2012. ^ "Travel | Yufuin". Metropolis. 10 October 2008. Retrieved 15 March 2012. ^ video clip: "Sochi 2014 Winter Olympics Closing Ceremony"
Chagall, Marc (1947). Heywood, Robert B., ed. The Works of the Mind: The Artist. Chicago: University of Chicago Press. OCLC 752682744. Compton, Susann, Chagall Harry N. Abrams, 1985. Forestier, Sylvie, Nathalie Hazan-Brunet, Dominique Jarrassé, Benoit Marq, Meret Meyer. 2017. Chagall: The Stained Glass Windows. Paulist Press. Moynahan, Brian Comrades 1917-Russian in Revolution, Boston: Little, Brown and Company, 1992, ISBN 0-316-58698-6. Shishanov V.A. Vitebsk Museum of Modern Art – a history of creation and a collection. 1918–1941. – Minsk: Medisont, 2007. – 144 p.
Wikimedia Commons has media related to Marc Chagall.